So you’ve earned your private pilot certificate, and you feel like you can take on the world? Ready to get out and fly to all of those places you've dreamed about? Go for it—but watch out for these common mistakes that new pilots make. Most new pilots are hesitant at first to get out and push the limits, but after you get your license and accrue a few hours of uneventful flying, you’ll be more likely to press the boundaries. Most general aviation accidents occur with private pilots at the stick, and the largest number of those pilots have less than 500 hours. This is a good time to be extra careful, not to exceed your personal limitations. If you feel like expanding your horizons or getting more practice with crosswind landings or at soft fields, enlist the help of an instructor. Remember, it's a license to learn! If you’re a new private pilot, you’re probably excited to take your friends and family flying. But be cautious—they may not be as excited as you are, and they’re definitely not as familiar. So make sure to give them a thorough briefing, explain everything that you’re doing, and don’t forget to bring a sick sack! And take them up on a nice calm day. I often see new private pilots taking mom or dad up when it’s gusting to 15 knots and bumpy. You want them to enjoy the flight, and you certainly don’t want to scare them or make them sick! New pilots don’t often have a lot of experience with ATC communications or within airspace other than at their home airport. Take the time to prepare ahead of time for any flights you make that require contact with ATC. You can’t fall back on your instructor to correct you anymore, and you can’t lean on the idea that you’ll just tell them you’re a student pilot and they’ll go easy on you. 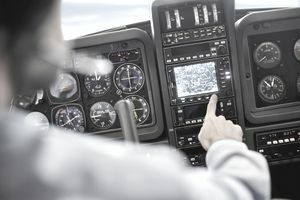 ATC is not to be feared, but take the time to listen to LiveATC.com or to practice the radio calls so that you can practice the right way. Okay, so if you’ve made it through the first three suggestions, that means you’re brave enough to get out and explore. When flights are accomplished within your personal margin of safety, you’ll gain valuable experience and the confidence to get out and explore more often. But many pilots, once they’ve completed the private pilot certificate, are burnt out, out of cash and out of energy, and they don't want to go out and explore, at least not immediately. Burnout certainly warrants a break from airplanes, but don’t take a break for too long! Get out and use your skills or else they’ll deteriorate. And the longer you go without flying, the less confident you’ll feel. So go fly somewhere! Don’t ever compare yourself to the pilots around you. We’re all different, and we all have different personal limitations and different ways of doing things. Just because you see two other pilots heading out on a windy day does not mean that you should. If you’re not comfortable, stand your ground and pay attention to your personal minimums. Don’t change your minimums just because you see other pilots with higher minimums. And don’t give in to the temptation to be as good as another pilot, or to show them up. It’s never worth it, and it’s way more embarrassing to crash an airplane than to cancel a flight and go home. Remember—there are old pilots and bold pilots, but no old, bold pilots.